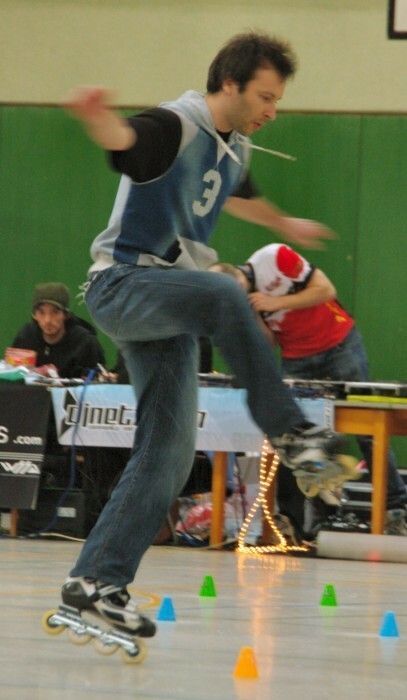 Compared to the first 2008 Edition: there were more people (thanks to an efficient advertising hype), the general level was higher (top-skaters were present), and the organisation – apart from a little misunderstanding about the timing – was as squared and efficient as last year. 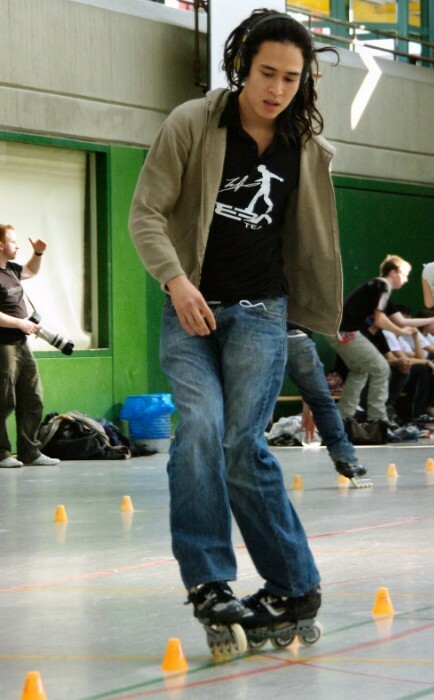 Amongst the mentioned Top-Skaters, there were 6 skaters of the WSSA world Top-20: Igor Cheremetieff (FRA, #1 WSSA), Rudy Op’t Veld (GER, #4), Tiziano Ferrari (ITA, #7), Xuan Le (FRA, #8), Mischa Gurevich (RUS, #10), Martin Sloboda (GER, #18). After the rave-up, we all went to the restaurant (Hello! 2 tables for 50 people, please) useless to describe the scene: The Comeback of the Skaters’ Invasion II !! Sunday was reserved to the Battles: women first at 11AM, and men next. 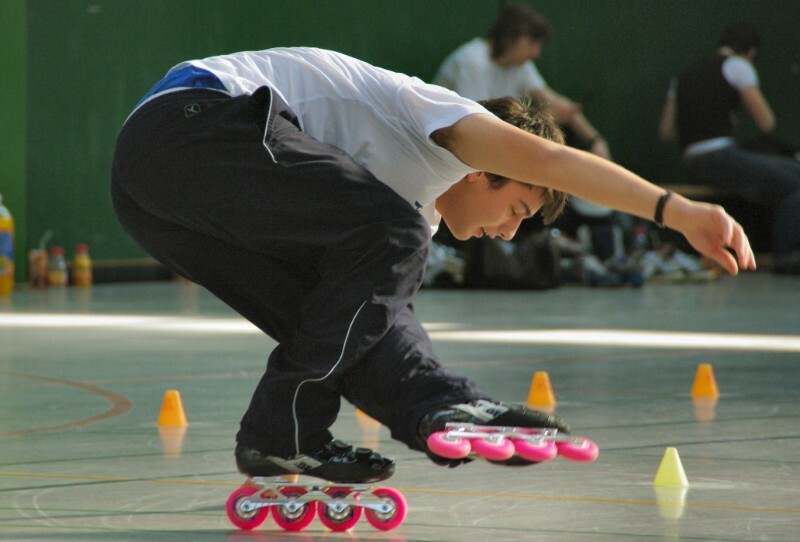 It took a long time indeed, but it was varied, and with a real tactical question and answer game between the skaters of the different groups… so that whether you are acting or just watching, you easily get hooked! As mentioned above, the category was unisex! (given the fact that there were only 4 girls registered). Amongst the 34 skaters, only the 16 best-ranked at the Time-Trials were to enter the KO Systems. An evolution was added to the evaluation of the penalties: the system now models itself on the other international rules as for the penalty given when you touch the ground with your free foot in the middle of your slalom. When your free foot touches the ground, you are disqualified for the current run. The two Italians Savio Brivio and Tiziano Ferrari are in the lead from the very beginning of the time-trials to the final of the KO Systems… and this is particularly true for S.Brivio, ranking first of the time-trials (5.22), 3 tenth ahead of the second, T.Ferrari (5.59). Sébastien Trocars (FRA) is on the heels of T.Ferrari with 5.61 – S.Trocars who gets out while the going is good for his first Battle competition! Follow the French Igor Cheremetieff (5.76), Xuan Le (5.78) and Chloé Seyrès (6.03). The times of the 10 other qualified are between 6.11 and 6.85 – amongst whom: Mischa Gurevich (RUS), Andre Stepczac and Martin Sloboda (GER), and Sébastien Laffargue (FRA). Maybe you thought that the times were slow..?! Yes they were slow indeed… but if you have read attentively from the beginning, probably you will have noticed my short comment on the somewhat soft ground – thus only little reactivity, which explains the slow times. Same thing: two winning runs for Grégoire Pinto (FRA), Xuan Le (FRA) and Mischa Gurevich (RUS) – at the expense of the Germans Florian Schneider, Martin Sloboda and Andre Stepczac. The other two rounds are a little bit closer: the first one opposes Igor Cheremetieff (FRA) to Sébastien Laffargue (FRA)… cones kicked on both lines… and finally I.Cheremetieff knocks out S.Laffargue. The second close round was made of Chloé Seyrès (FRA) and Martin Preukschat (GER) – equivalent times, but Chloé Seyrès gets the advantage thanks to clean runs. Once more, the two Italians pitilessly knock out their adversaries, Grégoire Pinto (FRA) and Mischa Gurevich (RUS), in two runs. All the same for Sébastien Trocars (FRA) who exterminates Chloé Seyrès (FRA) 3 tenth ahead of her for the two runs. It is harder to make forecasts for the round opposing the French Igor Cheremetieff and Xuan Le. After three somewhat chaotic runs (including the first run doing one foot backwards) it’s finally Xuan Le who wins the round, and the access to the semi-finals. Two France Vs. Italy rounds: Savio Brivio Vs. Xuan Le, and Tiziano Ferrari Vs. Sébastien Trocars. There again, two runs quickly done… the two Italians win, helped by the French who mounted up the cone kickings. It’s Sébastien Trocars (FRA) who takes hold of the 3rd place of the competition after a two-run round with times around 5.4, relegating Xuan Le at the foot of the podium. The two Italians confront each other. In pure speed, Savio Brivio has a good lead (running at more or less 5.2, whereas Tiziano Ferrari is around 5.4). Nevertheless S.Brivio offers the first run to T.Ferrari kicking one cone which relegates him one hundredth behind (5.43 Vs. 5.44). But he recovers concentration for the next two runs and Tiziano Ferrari perfects are not fast enough to rival with Savio Brivio’s times – even with a penalty on the 3rd run, S.Brivio keeps his lead with 5.4 against 5.47. It is thus Savio Brivio who wins beyond dispute the Speed Slalom category. 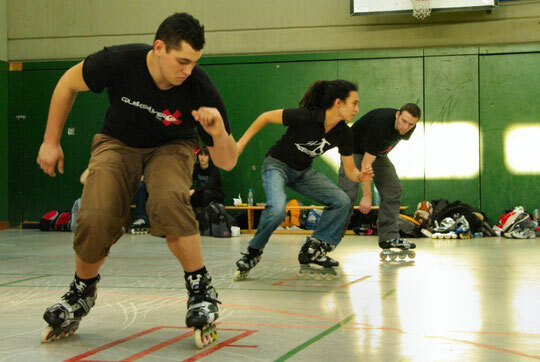 After the unisex final, a womens final took place. The two semi-finals were made up according to the time-trials ranking: Chloé Seyrès (FRA) against Simone Beyen (GER), and Miriam Kwasny (GER) agains Vicky Denissen (BEL). 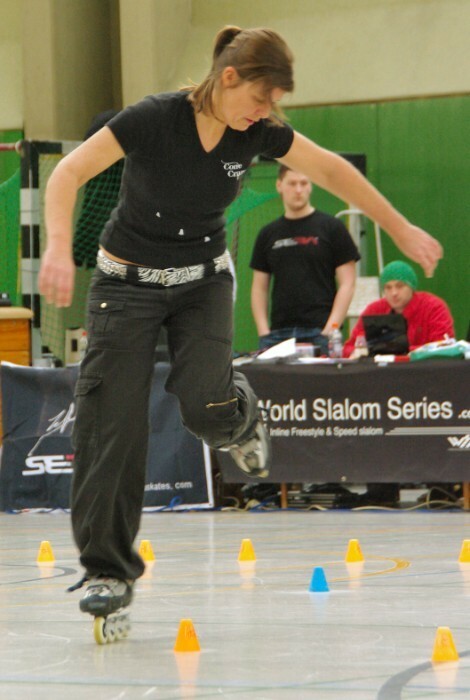 Chloé Seyrès and Miriam Kwasny were both in the finals – won by Chloé.Seyrès in two runs. As for the consolation final, it’s V.Denissen who gets the 3rd place on the podium. The Slide Contest unfolded according to the WSSA rules. In short: the qualifications consist in two basic slides per skater (that is to say, no combos). That time only four skaters were kept to make up the final group. Each finalist was treated to 4 slides – and only the three best slides were taken into account. To sum up the final… Grégoire Pinto (FRA) did a big backslide, a unity, and a combo acid-to-mistrial-to-J-slide ; Igor Cheremetieff (FRA) tried without success a big disaster parallel, a small disaster acid and a backslide-to-parallel; Tiziano Ferrari (ITA) did a sublime slide with his pants down (yeahh); and Andre Stepczak (GER) did nice mistrial-to-soyal. Roller Days 2009 Mönchengladbach - Final Slide Contest from fl0 on Vimeo. 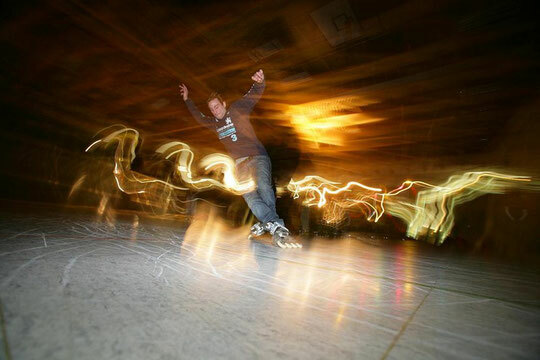 In fact it is a Battle organised for the skaters knocked out during the first phase of the qualifications – a kind of Amateur Battle. It was the last category on that Saturday, immediately following the mens battle qualifiers. The winner of the consolation tournament is Michel Schultz (GER), in front of Jurgens Peeters (BEL, #276) and Pascal Falcini (#NC), the French emigrated to Germany. Although Michel Schultz (GER, #59) was the favourite of his qualification group, he got knocked out by Jan Gresens (GER, #62) and Savio Brivio (ITA, #NC) for whom that was the first Battle competition. The number and the level of the women participating are far from equalizing those of the men, nevertheless a shy improvement is shown: 9 skaters divided into three groups of three for the qualifications. Skaters from Germany for most of them, but also from Belgium and France. Chloé Seyrès qualifies first for the semi-final, while the two other skaters, Isabelle Swennen (BEL) and Ina Vollprecht (GER) are treated to a last trick to decide between them. Finally Ina Vollspecht goes through thanks to a 20-cone toe alternate front cross. Simone Beyen (GER) – who has improved a lot since the last battles (nice back footgun!) – makes her presence felt in front of Vicky Denissen (BEL) whose style is undeniably harmonious and original, and Rebecca Matscha (GER) who stops at this stage of the competition. 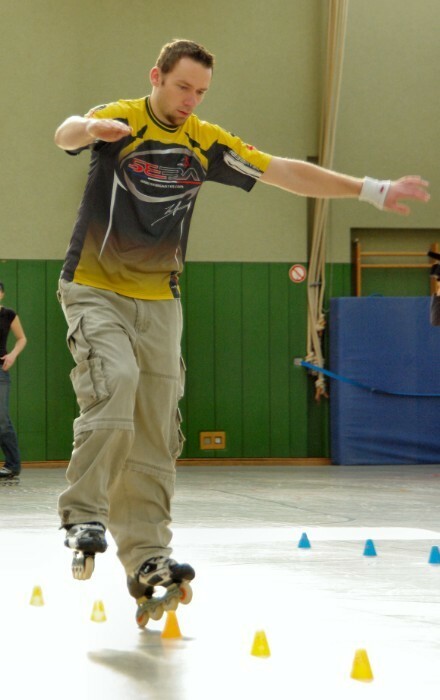 A huge surprise with the arrival of a new skater in the circuit, the extremely promising 18-year old Anya Ziertmann (GER) from Munich, who is leading the group with Korean spins, sevens, and front to back wheelings! The second place for the semi-final is given to Miriam Kwasny (GER) who show, just as usual, combos nearly essentially on toes – at the expense of Nancy De Mesmaeker (BEL). The three skaters knocked out at the qualifications are treated to a consolation round. 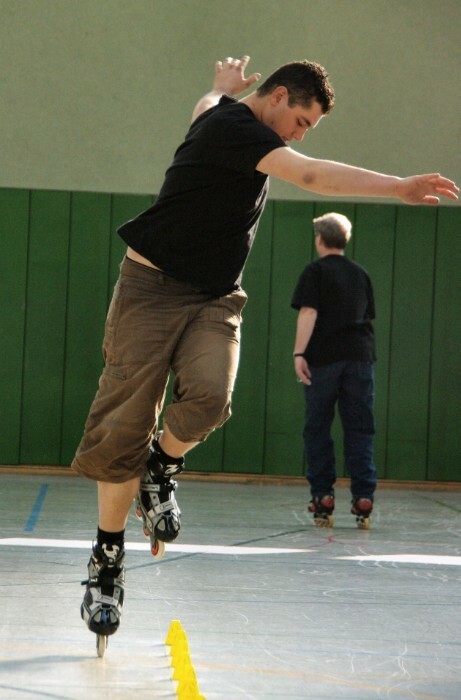 On the one hand this enables the participants to skate a little more than just one round, and on the other hand it is useful to establish a final ranking without ties. It’s Isabelle Swennen (BEL) who wins the round, followed by Rebecca Matscha (GER) and Nancy De Mesmaeker (BEL). Chloé Seyrès (FRA) is leading the competition. It is not easy to decide between the other two skaters, Miriam Kwasny (GER) and Vicky Denissen (BEL): M.Kwasny banking rather on technical difficulty, versus the stylish V.Denissen. finally M.Kwasny is the one who goes through to the final. The ranking is quickly drawn, Anya Ziertmann (GER) qualifies hands down, followed by Simone Beyen (GER) – letting Ina Vollspecht high and dry. The group is made up of the two competitors eliminated during the semi-finals, that is to say Vicky Denissen (BEL) and Ina Vollsprecht (GER). No surprise: V.Denissen wins the round one length ahead. Roller Days 2009 Mönchengladbach - Final Women from fl0 on Vimeo. Two internal duels: Chloé Seyrès and Anya Ziertmann coveting the 1st place, and Miriam Kwasny and Simone Beyen fighting for the 3rd place. At the end of the first runs, A.Ziertmann is leading thanks to neatly done Korean and uncross spins, small back wheelings and a 3-cone seven – slightly ahead of Chloé Seyrès who manages quite essentially front and back heel-toe compasses. Chloé Seyrès regains the advantage during the second runs with amongst other tricks, an amazing feat on the 14 cones of the 120s: a back-and-fro combo of sitting tricks consisting in kasakspins and kasatchoks – and coming back doing back kasatchoc starting from stop managing the 14 cones. 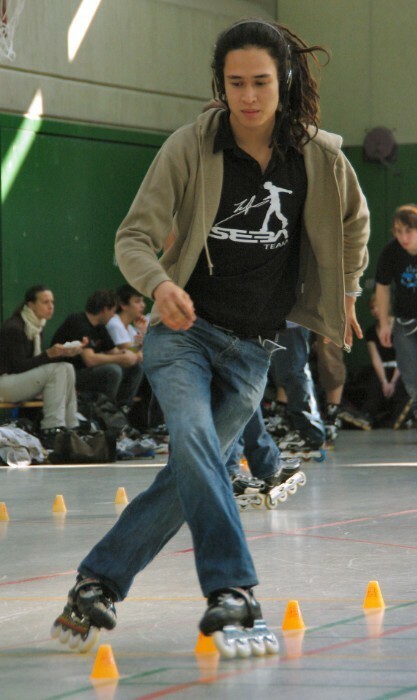 The third runs of the two skaters are equivalent (kind of muddled 3-cone sevens, chicken legs, back wheelings) but one combo is giving the upper hand to Chloé Seyrès: toe wheeling to 4-cone sewing-machine. As for the last tricks, Chloé Seyrès does toe wheeling snail and A.Ziertman misses twice Mario-slide to heel-toe Korean spin. As for simone Beyen and Miriam Kwasny, with equivalent difficulty and variety of tricks, M.Kwasny is neater than S.Beyen, which enables her to reach the third place on the podium. It had already begun in late afternoon on Saturday to cream off ‘till the eights finals, and it took the whole Sunday afternoon to be completed. 37 participants (about twenty Germans, but also skaters from France, Belgium, Italia, one Polish, one English and one Germano-Russian) divided into 12 groups for the qualifications which unfolded on the Saturday evening. Other interesting adversaries held out, particularly Antoine ‘TotoGT’ Colange from Lyon (FRA) and Sébastien Trocars from Paris (FRA) who went to tickle the grown-up in semi-finals; Aurélien Boudoux, the freestyle-slalom-breaker from Lyon (FRA), and Tim Schraepen (BEL) are knocked out during the quarter-finals, but freestyling ‘til the end! Let’s also note the presence of the Belgium people from ConeCrazy who arrived in force, and other Germans who fought well too. From the quarter-finals on, it becomes tricky to pass through the net of the qualifiers. Igor Cheremetieff (FRA) and Martin Sloboda (GER) take the lead beyond dispute. The other way around, the 3 other groups are closer. Antoine ‘TotoGT’ Colange (FRA) comes first… as for the second place it is hard to decide between Tim Schraepen (BEL) and Sébastien Trocars (FRA) – so that the judges ask for a first then for a second last trick! Finally it’s Sébastien Trocars who is keeps thanks to a 10-cone wheeling (which was initially meant to be grabbed) at the expense of Tim Schraepen who misses twice to do toe seven. The ranking is easier to make: Mischa Gurevich in front, thanks to his quickness and a varied and complex technique… followed by Tiziano Ferrari (ITA), Korean Style with his black jacket (yeah) whose technique enables him to take the advantage over Aurélien Boudoux (FRA) the other pretender to the second place of the group. Same scheme: Rudy Op’t Veld (GER) imposes himself… but who of Andre Stepczak (GER) and Antoine ‘TotoGT’ Colange is going to get the second place? Antoine Colange goes through thanks to the neatness of his performance. A super-nice first group made of Igor Cheremetieff (FRA), Xuan Le (FRA), Tiziano Ferrari (ITA) – who had their fun doing a remake of the WSC Battle Singapore (Dec.08); and Antoine ‘TotoGT’ Colange (FRA). X.Le and T.Ferrari particularly (the two pretenders to the second qualifying place) got going into showmen performances – kind of successful! Igor Cheremetieff gets on top of the group ranking, and the second ticket to the final is given to Xuan Le. The second group is made of Martin Sloboda (GER), Sébastien Trocars (FRA), Mischa Gurevich (RUS) and Rudy Op’t Veld (GER). Rudy Op’t Veld qualifies hands down (with a 20-cone back heel wheeling to start with on his first run!). The second place could go to Martin Sloboda (GER) as well as to Mischa Gurevich (RUS): and – though I was personally better convinced with M.Gurevich’s performance – it’s Martin Sloboda who finds favour with the jury (after a long deliberating debate). This group is made of the thirds and fourths of the semi-final groups, that is to say of: Tiziano Ferrari (ITA), Antoine Colange (FRA), Sébastien Trocars (FRA) and Mischa Gurevich (RUS). Tiziano Ferrari wins this round, followed by Antoine Colange, and then by Mischa Gurevich who somehow gave up after having been knocked out of the semi-finals, and at last by Sébastien Trocars who then ranks 8th for his first Battle competition. 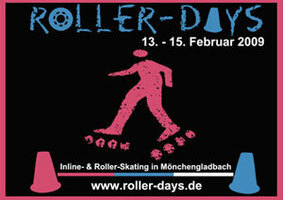 Roller Days 2009 Mönchengladbach - Final Men from fl0 on Vimeo. A configuration slightly different from that of the womens: a long-awaited open fight between Igor Cheremetieff and Rudy Op’t Veld, Martin Sloboda who tries to interfere in this dual, while Xuan Le keeps on with the showman mode activated in semi-final. Rudy Op’t Veld, at home, encouraged by his fans, and in peak form, facing Igor Cheremetieff a little tired (no kidding, he’s been ill the whole week). Thus even before the final, the dice were nearly already tossed. As for Xuan Le, he’s just having his fun with stylish freestyle ending the lines with back wheelings (heel and toe), punctuating the whole stuff with a little front-to-back wheeling to spin to show a little technique too. Igor Cheremetieff answers back in starting his second run with 720° doing toe chicken leg, linked to a nice disaster 180 to toe wheeling front to back, and followed with Korean spins to bloc to big backward heel-toe cross compass – he misses an external backward seven. 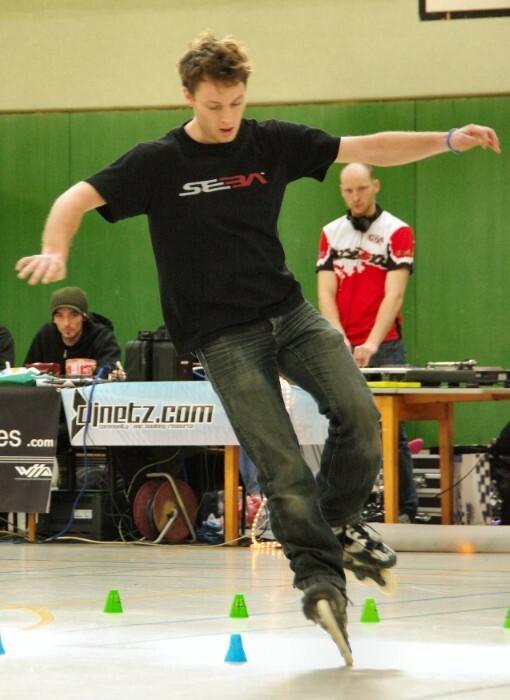 Martin Sloboda goes on with Korean spins to bloc to backward heel-toe cross compass, tries again toe seven with his hands in his back managing 4 cones this time, and also answers back to Rudy Op’t Veld doing heel spin with the free foot on the spinning one. Rudy Op’t Veld outbids doing Mario-slide to heel-toe cross compass to bloc to complete turn doing big backward heel-toe cross compass around two cones – as an answer to both Igor Cheremetieff and Martin Sloboda, (*taking my breath*), he goes on with a combo alternating between front and back sevens (one cone frontward, one cone backward, and so on), and does sitting tricks with an audacious combo made up of kasakspin to toe Korean spin. As for Xuan Le, he scatters his lines of style with Russian spins, with a spin ending sitting cross-legged, with an amazing disaster 180 to bloc, and he finishes his run doing wheeling front to toe (4x4 – but kicking cones while backwards). Igor Cheremetieff’s third run is mainly made up of a combo of sitting tricks on the 120s (footgun, kasakspin, footgun spin). Xuan Le’s turn now, and he manages pretty well with a smooth stylish run – with a 5-turn toe spin in the middle! 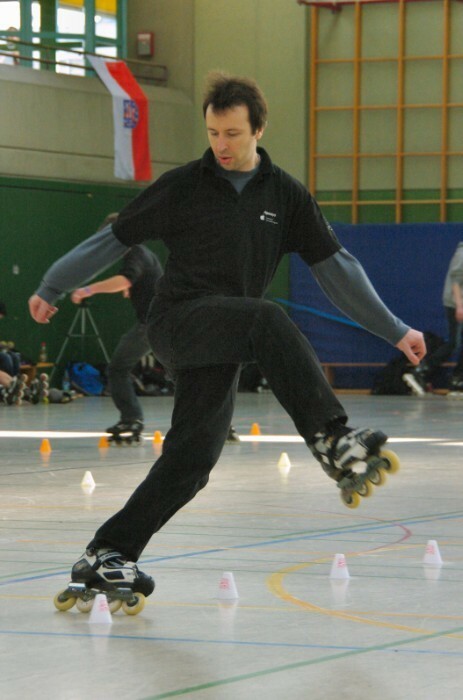 Martin Sloboda is playing on the 50s for the 3rd run with a 13-cone back heel wheeling, 4 cones doing sewing-machine, and wheeling front to back (only 2-cones backwards). Rudy answers back on the 50s dealing the death blow: a heel wheeling combo going frontward then 2-cone sewing-machine to backwards to frontwards (kicking 2 cones going back to front) – in short it was a 20-cone knitting exclusively with left back wheel! – and he finishes his run on the 80s doing heel special one foot managing 4 cones (which he tries to link with back wheeling but without success), and doing another combo mixing sitting tricks and spins turning around a cone doing external backward footgun to internal heel spin. Igor Cheremetieff: doing heel wheeling, starts with a backward external u-turn, gets frontward and turns around the cones, two by two, till he arrives at the end of the 10-cone 80s. Xuan Le: a perfectly neat front to back wheeling (4x6) on the 10-con 80s – to his greatest and happiest surprise! Martin Sloboda: a marathon doing heel wheeling starting from the big 80s, followed by the 50s, then by the small 80s, going backward on the last two cones, to frontward during the u-turn to re-start the 50s – that’s when he begins to grow tired, kicks cones and stops 2 cones before the end of the line. Next meeting on the 8 March for Battle Rome !